You’re going to fly from Los Angeles to Boston soon, and you want to be comfortable for your long flight. How much would you pay for a little extra legroom? JetBlue intends to find out by charging you for it. 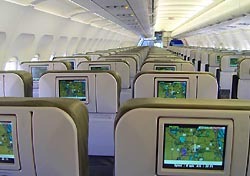 First, a history lesson: In December 2006, the airline reconfigured its planes to provide 36 inches of legroom for the seats in the first 11 rows. At the time we hailed the move as raising the bar on coach-class travel. Now JetBlue is changing the configuration again—and this time, the news isn’t so good. Rows two through five of the airplane, as well as the emergency exit row seats, will increase to 38 inches, but the rest of the plane will consist of 34-inch seats. Price increases for the 38-inch seats will start at $10 for short-haul flights, with prices varying for longer routes. In effect, many passengers will find they actually have less legroom, while a select few willing to pony up extra cash will get the better seats. Like everything else you’ve heard in the news, these extra fees are a result of higher fuel prices and a weak economy. And don’t expect any perks beyond the legroom: JetBlue Chief Executive David Barger claims they “are not going to a two-cabin airplane.” So you’re strictly paying the extra money just for those precious additional inches. Although if you ask nicely, you may be able to request more blue chip snacks. Given that JetBlue has designed whole advertising campaigns around its legroom in the past, I have a feeling this news won’t be trumpeted quite as proudly. If you’re a fan of more legroom and are willing to pay for it, great. But this news marks an essential change from the JetBlue product of the past. It used to be one seat category, prices subject to availability and demand. Now, there are two seat types, two price categories. And if you’re a bargain shopper, you’ll now have two fewer inches of seat pitch on those cheap seats.